Today we went for a trip to the mall to by treats. By treat, I mean treats of the shiny variety… an iPad for Dad (I think he already loves it more than me! :-P) and a pretty ring for Mum (anniversary present, lucky Mum :-)). Bubba was a fairly good girl, chatting away loudly (one shopper turned around because they thought it was a squeaky toy! 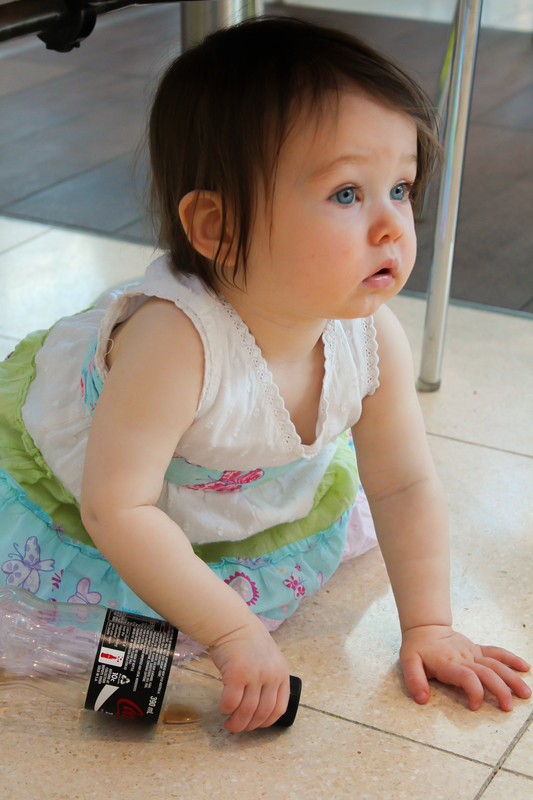 ), although she got a bit grizzly at being confined to the pram, so when we stopped for lunch I let her crawl around the food court, clutching her little Coke bottle tightly. I got a bit worried that people might think I had actually let her drink the Coke (I didn’t!! )… but it kept her happy while we finished our shopping, so judging eyes be damned I guess! Yeah, let people think what they want. You know and that’s all that matters.